Technical documentation in software engineering is the umbrella term that encompasses all written documents and materials dealing with software product development. All software development products, whether created by a small team or a large corporation, require some related documentation. And different types of documents are created through the whole software development lifecycle (SDLC). Documentation exists to explain product functionality, unify project-related information, and allow for discussing all significant questions arising between stakeholders and developers. On top of that, documentation errors can set gaps between the visions of stakeholders and engineers and, as a result, a proposed solution won’t meet stakeholders expectations. Consequently, managers should pay a lot of attention to documentation quality. 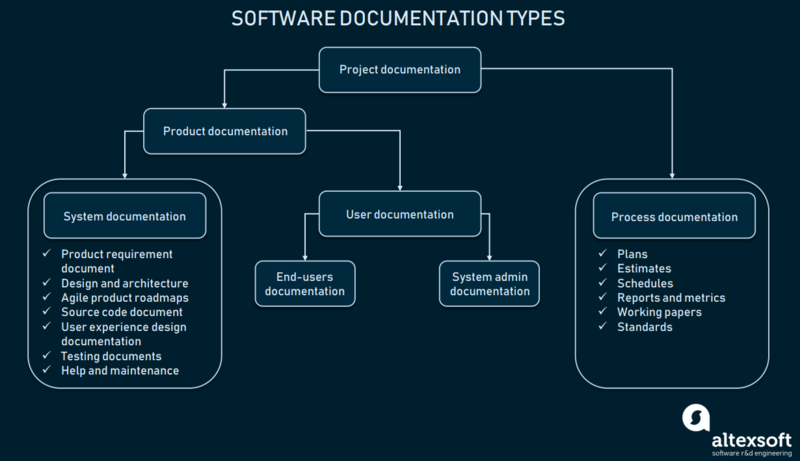 The documentation types that the team produces and its scope depending on the software development approach that was chosen. There are two main ones: agile and waterfall. Each is unique in terms of accompanying documentation. The Waterfall approach is a linear method with distinct goals for each development phase. Teams that use waterfall spend a reasonable amount of time on product planning in the early stages of the project. They create an extensive overview of the main goals and objectives and plan what the working process will look like. 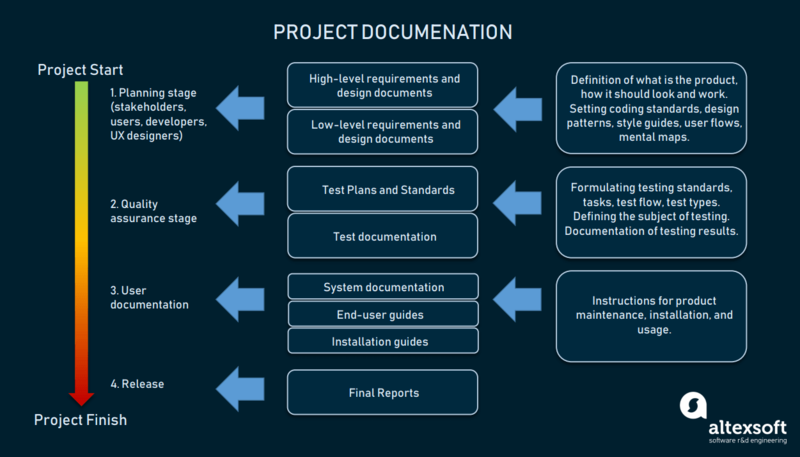 Waterfall teams strive to create detailed documentation before any of the engineering stages begin. Careful planning works well for projects with little to no changes in progress as it allows for precise budgeting and time estimates. However, waterfall planning has proven to be ineffective for long-term development as it doesn’t account for possible changes and contingencies on the go. According to PMI’s 9th Global Project Management Survey, the Agile approach is used by 71 percent of organizations for their projects. The agile approach is based on teamwork, close collaboration with customers and stakeholders, flexibility, and ability to quickly respond to changes. The basic building blocks of agile development are iterations; each one of them includes planning, analysis, design, development, and testing. The agile method doesn’t require comprehensive documentation at the beginning. Managers don’t need to plan much in advance because things can change as the project evolves. This allows for just-in-time planning. As one of the Agile Manifesto values suggests, putting – “working software over comprehensive documentation -“, the idea is to produce documentation with information that is essential to move forward, when it makes the most sense. Today, agile is the most common practice in software development, so we’ll focus on documentation practices related to this method. The main goal of effective documentation is to ensure that developers and stakeholders are headed in the same direction to accomplish the objectives of the project. To achieve them, plenty of documentation types exist. Adhering to the following classifications. System documentation represents documents that describe the system itself and its parts. It includes requirements documents, design decisions, architecture descriptions, program source code, and FAQs. User documentation covers manuals that are mainly prepared for end-users of the product and system administrators. User documentation includes tutorials, user guides, troubleshooting manuals, installation, and reference manuals. Process documentation represents all documents produced during development and maintenance that describe… well, the process. The common examples of process-related documents are standards, project documentation, such as project plans, test schedules, reports, meeting notes, or even business correspondence. The main difference between process and product documentation is that the first one record the process of development and the second one describes the product that is being developed. System documentation provides an overview of the system and helps engineers and stakeholders understand the underlying technology. It usually consists of the requirements document, architecture design, source code, validation docs, verification and testing info, and a maintenance or help guide. It’s worth emphasizing that this list isn’t exhaustive. So, let’s have a look at the details of the main types. A product requirement document or PRD provides information about system functionality. Generally, requirements are the statements of what a system should do. It contains business rules, user stories, use cases, etc. This document should be clear and shouldn’t be an extensive and solid wall of text. It should contain enough to outline the product’s purpose, its features, functionalities, maintenance, and behavior. The best practice is to write a requirement document using a single, consistent template that all team members adhere to. The one web-page form will help you keep the document concise and save the time spent on accessing the information. 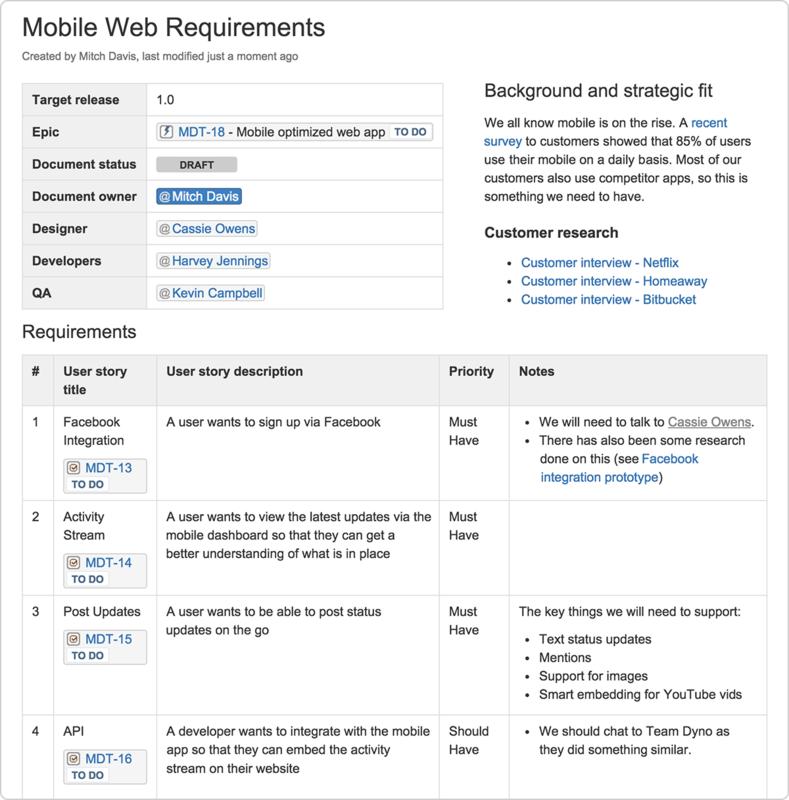 Here’s a look at an example of a one-web-page product-requirements document to understand various elements that should be included in your PRD. Nevertheless, you should remember that this isn’t the one and only way to compile this document. Roles and responsibilities. Start your document with the information about project participants including a product owner, team members, and stakeholders. These details will clarify responsibilities and communicate the target release goals for each of the team members. Team goals and business objective. Define the most important goals in a short point form. Background and strategic fit. Provide a brief explanation of the strategic aim of your actions. Why are you building the product? How do your actions affect product development and align with the company’s goals? Assumptions. Create a list of technical or business assumptions that the team might have. User Stories. List or link user stories that are required for the project. A user story is a document written from the point of view of a person using your software product. The user story is a short description of customer actions and results they want to achieve. Acceptance criteria. Those are the conditions that indicate a user story is completed. The main purpose of acceptance criteria is to define a satisfactory result for a usage scenario from the end-user perspective. Check our dedicated article on acceptance criteria to learn more. User interaction and design. Link the design explorations and wireframes to the page. Questions. As the team solves the problems along the project progression, they inevitably have many questions arising. A good practice is to record all these questions and track them. Not doing. List the things which you aren’t doing now but plan on doing soon. Such a list will help you organize your teamwork and prioritize features. Use links and anchors. They will help you make the document easier to read and search as readers will be able to comprehend the information gradually. For instance, you can provide links to customer interviews and anchors to previous discussions or other external information related to the project. Use diagramming tools to better communicate the problems to your team. People are more likely to perceive information by looking at the images than reading an extensive document. Different visual models will help you to perform this task and outline requirements more effectively. You can incorporate diagrams into your requirements process using the following software diagramming tools: Visio, Gliffy, Balsamiq, Axure or SmartArt in Microsoft Office. User experience design begins at the requirements stage and proceeds through all the stages of development, including the testing and post-release stages. The process of UX design includes research, prototyping, usability testing, and the actual designing part, during which lots of documentation and deliverables are produced. 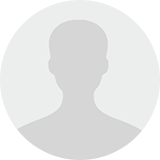 User Personas are created and documented during the research stage. The information gathered during user interviews and surveys is compiled into functional user persona documents. User personas represent the key characteristics of real users, focusing on behavior, thought patterns, and motivation. A user scenario is a document that describes the steps a user persona will take to accomplish a specific task. User scenarios focus on what a user will do, rather than outlining the thought process. The set of scenarios can be either visual or narrative, and describe the existing scenarios or future functionality. 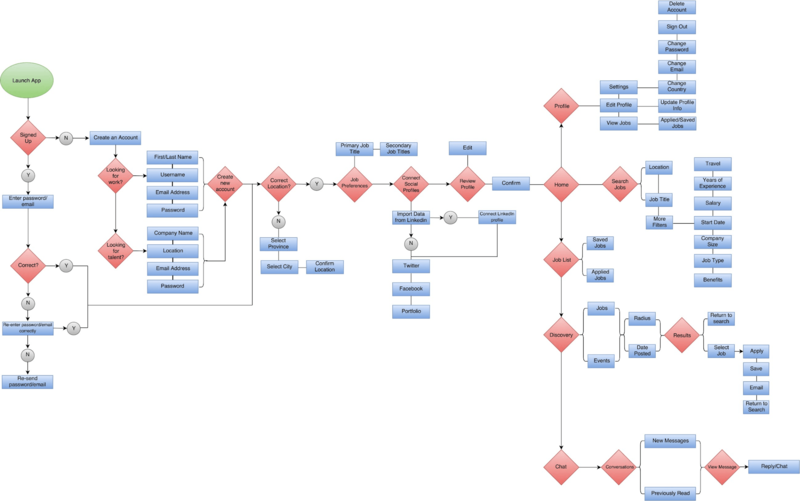 Scenario maps are used to compile the existing user scenarios into a single document. Scenario maps show all possible scenarios available at a given moment. The main purpose of a scenario map is to depict all the possible scenarios for every single function, as well as intersecting scenario steps. A user story map is formed from the backlog of the product. This type of document helps to arrange the user stories into future functions or parts of the application. 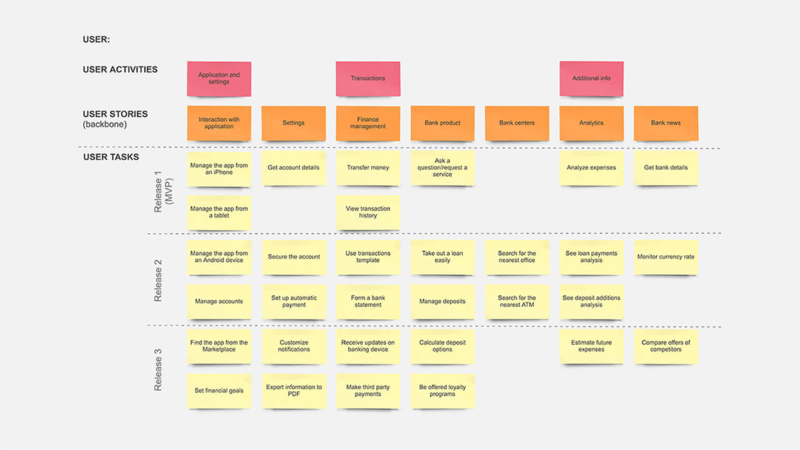 A user story map can be a scheme, or a table of user stories grouped in a particular order to denote the required functions for a certain sprint. The UX style guide is a document that includes the design patterns for the future product. It also describes all possible UI elements and content types used, defining the rules of how they should be arranged and work with each other. But, unlike a UI style guide, UX designers don’t describe the actual look of the interface. 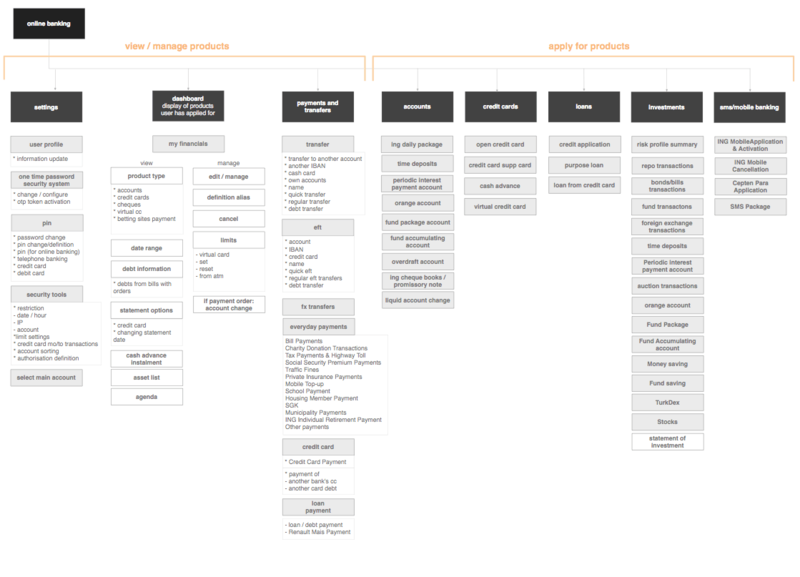 A site/product map is a visual scheme that represents the connection between all pages of a product. The map helps the whole team visualize the structure of a website or app and the connections between the pages/functions. Creating a site map is a part of arranging the information architecture. User flow or user journey schemes help the team to map the steps a user should take through the whole product. The main task of a user flow scheme is to depict the possible steps a user may take, going from page to page. Usually, the scheme includes all the pages, sections, buttons, and functions they provide to show the logic of user movement. Wireframes are the blueprints for future UI. Basically, wireframes are the schemes that show how to arrange the elements on the page and how they should behave. But, wireframes don’t depict what those elements should look like. A mock-up is the next product design stage, showing the actual look and feel of a product. Basically, mock-ups are static images representing the final product design. A prototype is a mock-up that you can interact with: click some buttons, navigate between different pages, and so on. A prototype can be created in a prototyping tool like Sketch or MockFlow. Using templates, UX designers can create interactive mock-ups on the early stages of development to be employed for usability testing. A usability testing report is a short-form feedback document created to communicate the results of usability testing. The report should be as short as possible, with visual examples prevailing over text. Software design document template. Discuss and form a consensus with stakeholders regarding what needs to be covered in the architecture design document before it has been created and use a defined template to map architectural solutions. Architecture & Design Principles. Underline the guiding architecture and design principles with which you will engineer the product. For instance, if you plan to structure your solution using microservices architecture, don’t forget to specifically mention this. User Story description. Connect user stories with associated business processes and related scenarios. You should try to avoid technical details in this section. Solution details. Describe the contemplated solution by listing planned services, modules, components, and their importance. Diagrammatic representation of the solution. Identify the diagrams that need to be created to help understand and communicate the structure and design principles. A source code document is a technical section that explains how the code works. While it’s not necessary, the aspects that have the greatest potential to confuse should be covered. The main users of the source code documents are software engineers. Try to keep the document simple by making short sections for each element and supporting them with brief descriptions. A quality management plan is an analog of a requirement document dedicated to testing. This document sets the required standard for product quality and describes the methods to achieve this level. The plan helps to schedule QA tasks and manage testing activity for product managers, but, it is mainly used for large-scale projects. A test strategy is a document that describes the software testing approach to achieve testing objectives. This document includes information about team structure and resource needs along with what should be prioritized during testing. A test strategy is usually static as the strategy is defined for the entire development scope. A test case specifications document is a set of detailed actions to verify each feature or functionality of a product. Usually, a QA team writes a separate specifications document for each product unit. Test case specifications are based on the approach outlined in the test plan. A good practice is to simplify specifications description and avoid test case repetitions. Test checklist is a list of tests that should be run at a particular time. It represents what tests are completed and how many have failed. All points in the test checklists should be defined correctly. Try to group test points in the checklists. This approach will help you keep track of them during your work and not lose any. If it helps testers to check the app correctly, you can add comments to your points on the list. This document should describe known problems with the system and their solutions. It also should represent the dependencies between different parts of the system. Nearly any product has its APIs or Application Programming Interfaces. Their documentation informs developers how to effectively use and connect to the required APIs. API documentation is a deliverable produced by technical writers as tutorials and guides. This type of documentation should also contain the list of all available APIs with specs for each one. The documentation created for end-users should explain in the shortest way possible how the software can help solve their problems. Some parts of user documentation, such as tutorials and onboarding, in many large customer-based products are replaced with onboarding training. Nevertheless, there are still complex systems remaining that require documented user guides. In order to provide the best service for end-users, you should collect your customer feedback continuously. The wiki system is one of the more useful practices. It helps to maintain the existing documentation. If you use the wiki system you won’t need to export documents to presentable formats and upload them the servers. You can create your wiki pages using a wiki markup language and HTML code. Functional description – describes the functionalities of the product. Most parts of this document are produced after consultation with a user or an owner. 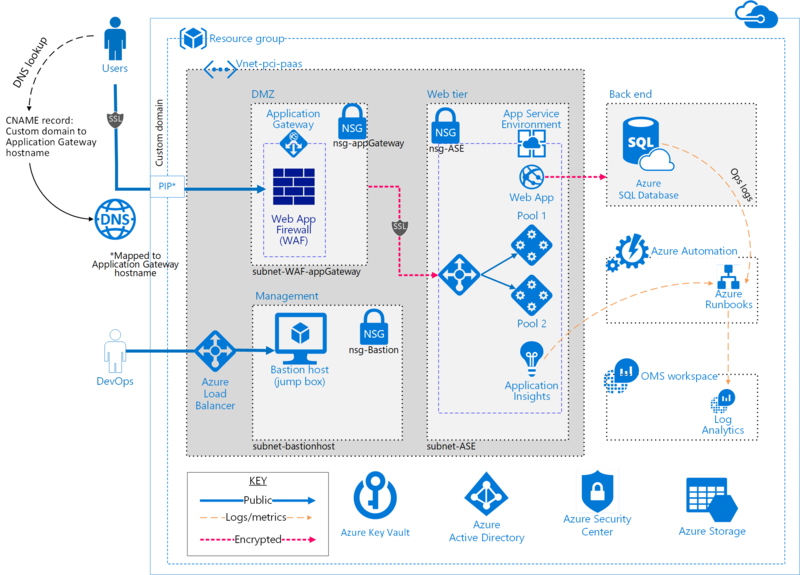 System admin guide – explains different types of behaviors of the system in different environments and with other systems. It also should provide instructions on how to deal with malfunction situations. Plans, estimates, and schedules. These documents are usually created before the project starts and can be altered as the product evolves. Reports and metrics. Reports reflect how time and human resources were used during development. They can be generated on a daily, weekly, or monthly basis. Consult our article on agile delivery metrics to learn more about process documents such as velocity chats, sprint burndown charts, and release burndown charts. Working papers. These documents exist to record engineers’ ideas and thoughts during project implementation. Working papers usually contain some information about an engineer’s code, sketches, and ideas on how to solve technical issues. While they shouldn’t be the major source of information, keeping track of them allows for retrieving highly specific project details if needed. Standards. The section on standards should include all coding and UX standards that the team adheres to along the project’s progression. The majority of process documents are specific to the particular moment or phase of the process. As a result, these documents quickly become outdated and obsolete. But they still should be kept as part of development because they may become useful in implementing similar tasks or maintenance in the future. Also, process documentation helps to make the whole development more transparent and easier to manage. The main goal of process documentation is to reduce the amount of system documentation. In order to achieve this, write the minimal documentation plan. List the key contacts, release dates, and your expectations with assumptions. 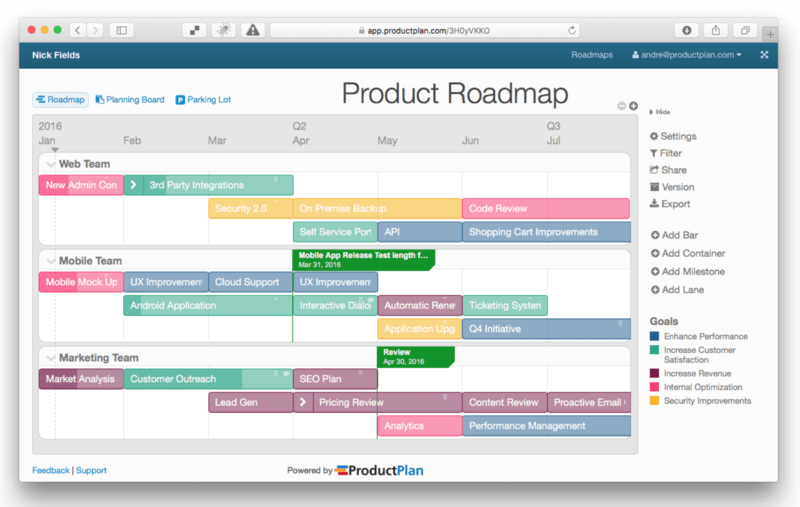 Product roadmaps are used in Agile software development to document vision, strategy, and overall goals of the project. Roadmaps are used as process documents to keep the course of development in sync with initial goals. Depending on the type of product roadmap, it can express high-level objectives, prioritization of tasks, the sprint timeline, or low-level details. A strategic roadmap is a high-level strategic document, that contains overall information on the project. Strategic roadmaps usually state a vision and long-term goals. In the case of agile product development, a roadmap can be arranged in themes. Themes are multiple tasks that a team must complete and are somehow connected. For instance, a theme may sound like “enhance page-loading speed,” which entails a handful of actions. Grouping the information around the themes makes a roadmap highly flexible and updatable, which is a great fit for sprint-based development. The best advice concerning strategic roadmapping is to include only important information. Otherwise, you risk turning your roadmap into a clumsy scheme, difficult to both understand and maintain. A technology roadmap or IT roadmap is a low-level document that describes technical requirements and the means of technology implementation. IT roadmaps are quite detailed. They contain the information on each deliverable, explaining the reason for such a decision. A release plan is used to set strict time limits for releases. A release plan should focus on the actual deadlines without specifying release details. It is highly recommended to use roadmap specific tools to create your own roadmaps. Online tools like Roadmunk provide various templates for product roadmaps, allow quick editing, and provide easy sharing across all team members. Keep in mind, that a roadmap, depending on its type, can be a product document that states requirements. It also describes the process and guides your team through development. 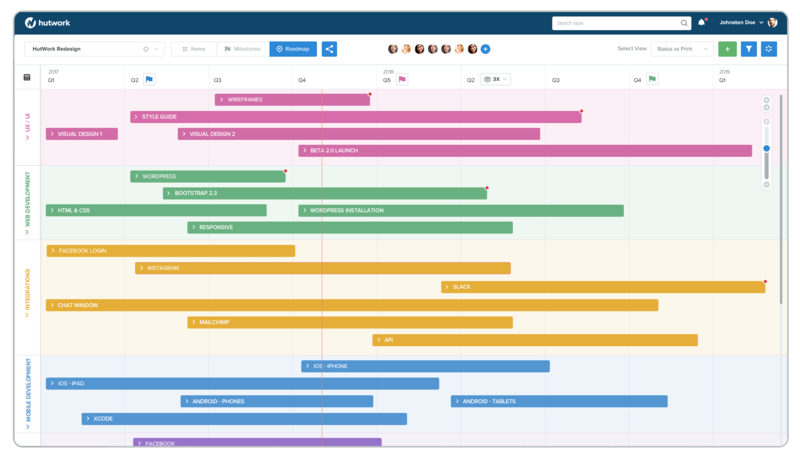 Atlassian Confluence is the most popular collaborative project tool that has the whole ecosystem for managing product requirements and writing documentation. Confluence is known for a stable wiki system and an efficient user story management interface. Document 360 is a self-service knowledge base/software documentation platform designed for Software-as-a-Service products. ai is a tool for collaborative documentation creation, storing, data sharing, and using a wiki system. The documentation is interactive, meaning that developers can embed blocks or snippets of code right into the document and share it in one click. Once you finish editing your documentation, you can save it in PDF or markdown format, and post on any other platform. Github needs no introduction, except for those who want to use it for software documentation. It provides you with its own wiki system and allows for converting your documentation into a compelling website showcases. It’s a good practice to use roadmap specific tools, as they allow you to share the information quickly, update timelines or themes, add new points, and edit the whole structure. Most roadmapping tools provide templates for different roadmaps to let you start working with this document right away. Basically, all the tools offer free trials and paid plans with differences in templates, numbers of roadmaps, and persons you can share them with. Sketch is a simple but powerful vector-based design tool that has a web-application and a Mac desktop client. Sketch is popular and quite simple, offering enough capabilities for designing interfaces. InVision is one of the most popular tools for prototyping. InVision is famous for its collaborative features and cross-platform capabilities, making it a great tool for designing future interfaces. UXPin is a Mac and Windows design tools that allows you to build any type of blueprints. You can also upload your sketches or wireframes from other products and make an interactive prototype of it. Adobe XD – where XD stands for experience design. The product is aimed at UX specialists. 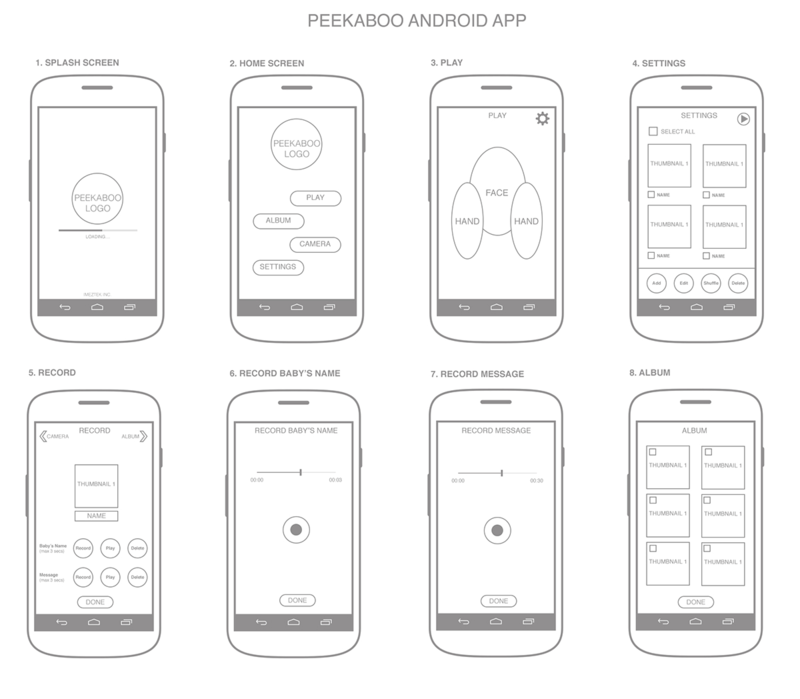 It allows designers to create high-fidelity prototypes and share them via the app. Swagger is a free self-documenting software service designed to create and update RESTful web services and APIs. RAML 2 HTML is a simple documentation generator that uses RAML specifications. umkc.edu – a list of different testing, architectural, requirement documents, and plans. Atlassian Confluence Templates. 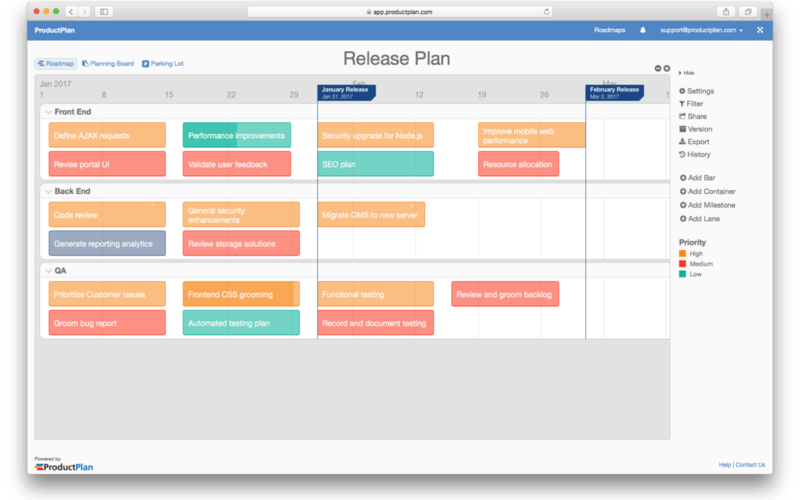 Atlassian provides general-purpose project documentation templates with their product out of the box. com – documentation templates for quality assurance specialists. These include testing checklists, smoke testing templates, test plans, and more. ReadySET is a large library of software documentation templates in HTML that include planning documents, architecture, design, requirements, testing, and many more. ReadTheDocs is an all-in-one template made with ReadTheDocs platform, providing instructions on writing each type of document you may need, from architecture and UML diagrams to user manuals. You should find a balance between no documentation and excessive documentation. Poor documentation causes many errors and reduces efficiency in every phase of software product development. At the same time, there is no need to provide an abundance of documentation and to repeat information in several papers. Only the most necessary and relevant information should be documented. Finding the right balance also entails analyzing the project’s complexity before development starts. This means that you should keep your documentation up-to-date. It is very important as documents that aren’t current automatically lose their value. If requirements change during software development, you need to ensure that there’s a systematic documentation update process that includes information that has changed. You can use automatic version control to manage this process more efficiently. The agile method is based on a collaborative approach to creating documentation. If you want to achieve efficiency, interview programmers and testers about the functionalities of the software. 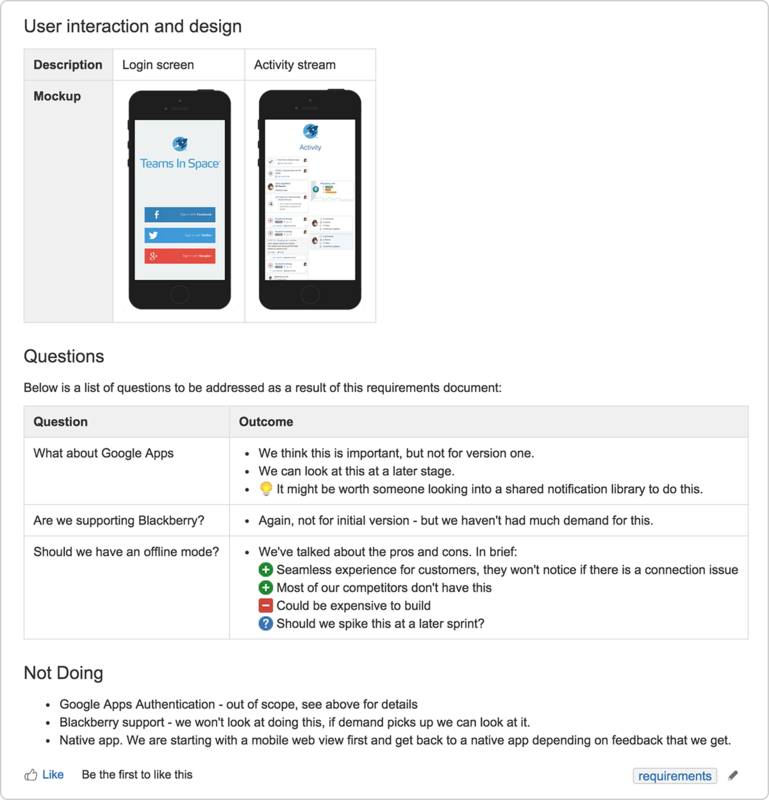 Then, after you have written some documentation, share it with your team and get feedback. To get more information try to comment, ask questions, and encourage others to share their thoughts and ideas. Every team member can make a valuable contribution to the documents you produce. If you can, it worth hiring an employee who will take care of your documentation. The person who generally does this job is called a technical writer. A tech writer with an engineering background can gather information from developers without requiring someone to explain in detail what is going on. It’s also worth embedding a technical writer as a team member, locating this person in the same office to establish close cooperation. He or she will be able to take part in regular meetings and discussions. Use cross-links between documents, whether those are product pages or user guides. Proper navigation through your documentation is important to give the reader the right understanding of a subject. Such practice can be considered user-flow, but for your project documentation. Documentation can be dedicated to internal or external usage. In the case of external documents, it is better to provide a clear explanation of every term, and its specific meaning in the project. Documentation should communicate ideas in clear language to set lingua franca between stakeholders, internal members, and users. The agile methodology encourages engineering teams to always focus on delivering value to their customers. This key principle must also be considered in the process of producing software documentation. Good software documentation should be provided whether it is a software specifications document for programmers and testers or software manuals for end users. Comprehensive software documentation is specific, concise, and relevant. As we have mentioned above, it’s not obligatory to produce the entire set of documents described in this article. You should rather focus only on those documents that directly help achieve project objectives. You need to add documentation maintenance to your content. Lots of companies spend lots of money creating documents; then they don’t maintain them, so the document becomes useless within a few weeks, months, or years.